During their residency at Brisons Veor in May, three artists facilitated a workshop for a group of year 10 pupils from The Cape School in St Just…. ‘We wanted to do something for the community during our residency at Brisons Veor. 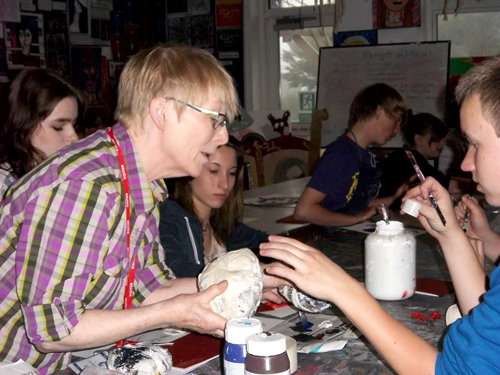 Annie Halliday put us in contact with Amanda Beamish, the Head of Art at The Cape School. As qualified art teachers we know how important it is for students to get their portfolios together for GCSE. With this in mind we planned to cover key activities such as: collecting, collating, observing, responding, developing and then processing. We decided a topic focussing on the pebbles in Priest Cove would be ideal. We had 4 hours. First we showed them how good it is to collect ideas in a sketchbook but collecting pebbles was out as the weather was atrocious. Luckily we’d collected some before ourselves (to be duly returned). At the Brisons Veor studio students chose ones they liked and then did drawings which were large and showing tone, texture and detail with a view to developing them later in school. The students were challenged to look at things afresh e.g. ‘imagine your pebble has a personality – try and express it’. Some used unfamiliar media too e.g. inks with a pipette. 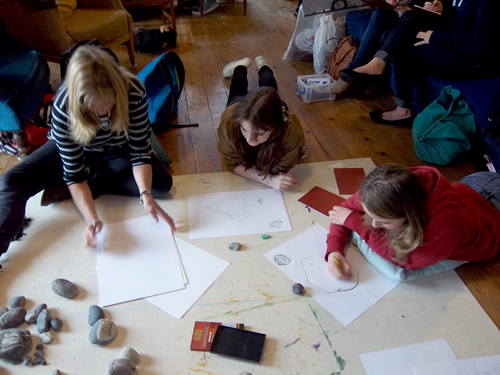 Back in school, the group worked in 3 areas to develop their observational work: monoprinting, bas relief in tile cement and paper sculpting pebbles. We demonstrated then assisted them. 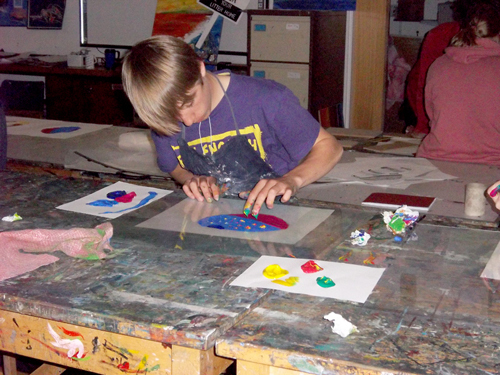 The students were excited by the strong images they produced in monoprinting using bright acrylic paint on perspex. Sculpting in paper was a new skill too and they enjoyed using newsprint, PVA, acrylic paint and scrim. They also worked in tile cement to produce graffito and collage effects.